Madrid. A blend of history, art and fashion. While I have so many fond memories of this lively city — Picasso’s Guernica at the Reina Sofia museum, the throne room at the Palacio Real, the impressive grandeur of the Plaza Mayor, and the ubiquitous jamon y queso — what I remember most were the giant, 10-foot shoes decorating Calle Serrano, Madrid’s most fashionable street. A temporary exhibition in June called “Shoe Street Art” lined the sidewalks with about 25 stiletto shoes made from fiberglass and polyester. Each shoe had a unique design, exploding with color. The exhibition was a delightful expression of contemporary art and fashion, in the midst of a city rich in tradition and culture. Manolo Blahnik, eat your heart out. Need help with an upcoming vacation? Contact me. 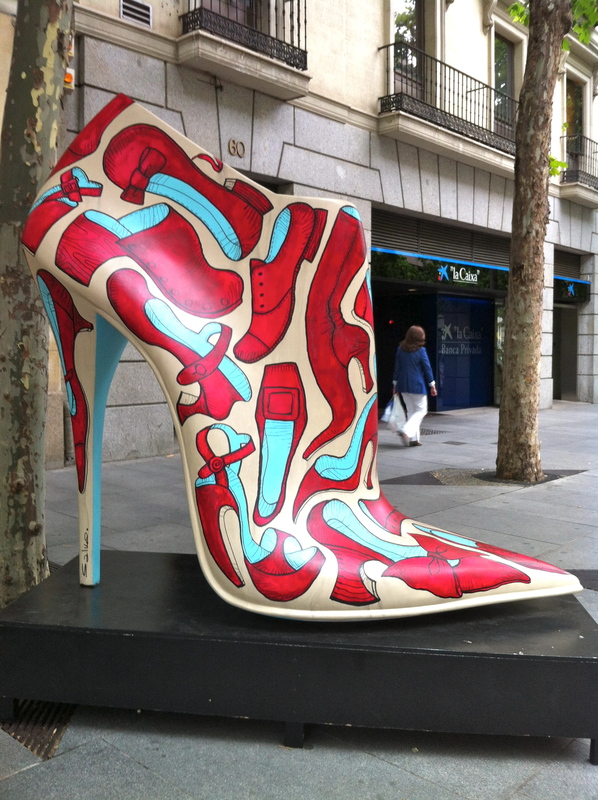 This entry was posted in Destinations and tagged Destinations, fashion, Madrid, shoes, Spain by planyourtrips. Bookmark the permalink.